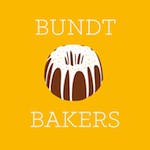 The theme for #BundtBakers this month is Yeasted Bundts. We were challenged to bake a bundt with yeast as the leavening agent, and our bundt could be sweet or savory. 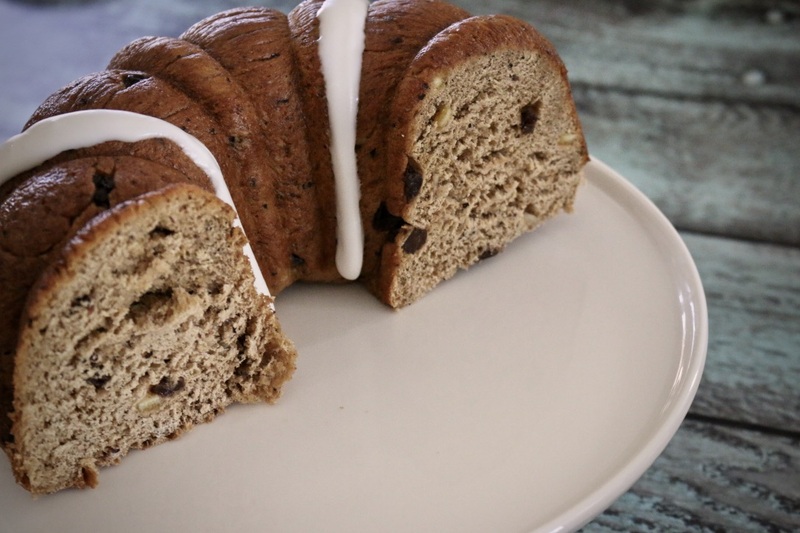 I knew immediately that I wanted to make hot cross buns in a bundt pan, but I could not find anyone online who had tried this before, so I knew I was in for some experimenting. Hot Cross Buns are one of my favorite breads and are very popular in Australia. They usually make an appearance on January 1st - tradition dictates that you have to at least wait for Christmas and New Years Eve to be over - in grocery stores, and are available all the way to Easter. However, in Hawaii, they can be hard to find and even when you do find them they are not really what I would consider a traditional Hot Cross Bun (hello Safeway, I'm talking to you and your fancy lemon curd crosses and weird green glacé fruit). 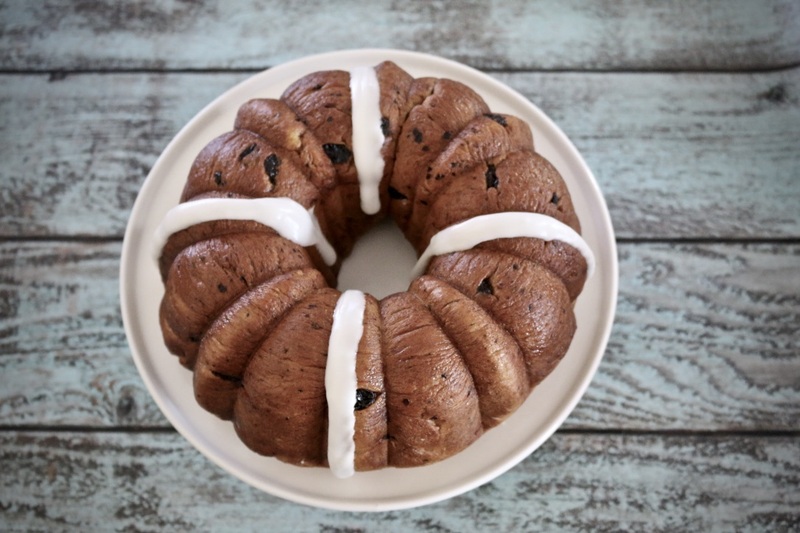 I am partial to a bun that is heavy on the spices and fruit, so I chose a Hot Cross Bun recipe that reflected this, and adapted it as needed. 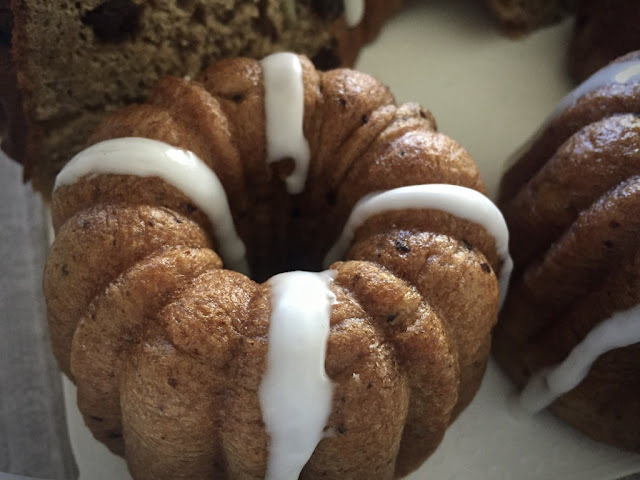 These buns are surprisingly easy to make at home, and it really was not that hard to adapt them to my mini bundt pan with six holes and a regular size bundt pan - I just had to guess at the amount of dough to use in each. I like to use metric measurements (that's the Aussie in me), so I simply guessed at the mini bundt holes looking like they would accommodate about 100g of dough, weighed out six portions at 100g each. I then rolled each one in a ball, next I rolled it into a log shape, and finally placed the log around the center tube gently pinching it together to form a complete circle. The remaining dough was rolled in a large ball and I used the same technique as I did for the mini bundt pan to place it in my regular-sized bundt pan. I covered the pans with plastic wrap and placed them in my pantry for proofing. The Hot Cross Bundts rose beautifully in the oven, almost too well as the little ones were a little roly-poly when I took them out. I was happy to see this since I was trying out some Red Star Platinum Superior Baking Yeast that I had won in a competition, and now I am keeping my fingers crossed that someone here stocks it because it was really good. To ensure quality control I tried one as soon as they were cool enough to handle. Bread is my comfort food, and I have to say these were definitely comforting. And very addictive. They had just the right ratio of spice to fruit to bread. To make them look like Hot Cross Buns I piped icing crosses on the top of the mini bundts and the larger bundt. Immediately after taking some photos I cut the large one in half and took it to my neighbor, as I knew it would be too dangerous to have it in the house. The little ones were so yummy when they were warmed and eaten with a good cup of tea. We enjoyed the big bundt by cutting it into slices and toasting it, and served with a little, ok maybe a lot, of butter. If you would like to know more about #BundtBakers and see what the other bakers made for our Yeasted Bundts theme please scroll down below the recipe. Wendy from A Day in the Life on the Farm and I co-hosted the Yeasted Bundts event this month - thanks Wendy for teaming up with me! Place milk and butter in a small saucepan over medium–low heat and stir until melted, cool slightly. Place flour, sugar, yeast, spices, dried fruit, mixed and salt in the bowl of an electric mixer fitted with a paddle, stir until fully combined. Add egg and milk mixture, stir until fully incorporated. Change to a dough hook and knead for approximately 7 minutes or until smooth and elastic, adding a little more flour as needed. Whilst dough is kneading, prepare bundt pan(s) - I used this mini bundt pan and a regular bundt pan - by spraying them with baking spray. 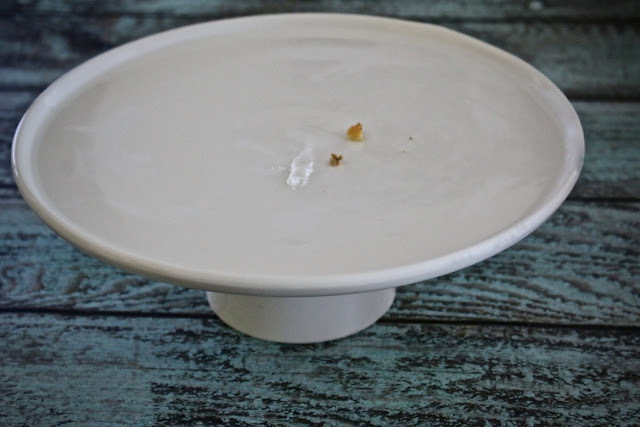 For the mini bundts, use a scale to weigh out 100g of the dough, roll gently in a ball, and then shape into a log that is long enough to fit around the center tube, and gently press to join the two ends. 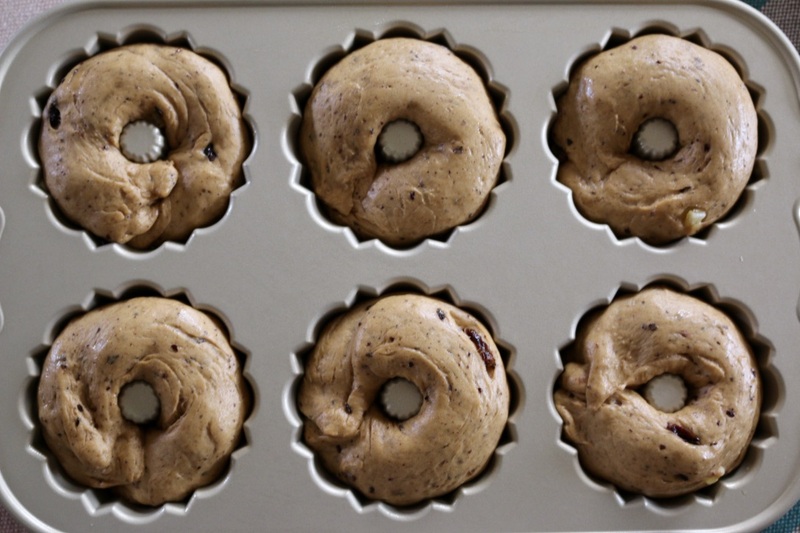 For the regular bundt, using the remaining dough, roll into a ball and then into a log to fit around the center tube, and gently press to join the two ends. Cover the mini bundt pan and the regular bundt pan with plastic wrap, and then place in a warm, draught-free area for one hour or until the dough doubles in size. Whilst the dough is rising, preheat oven to 205°C. 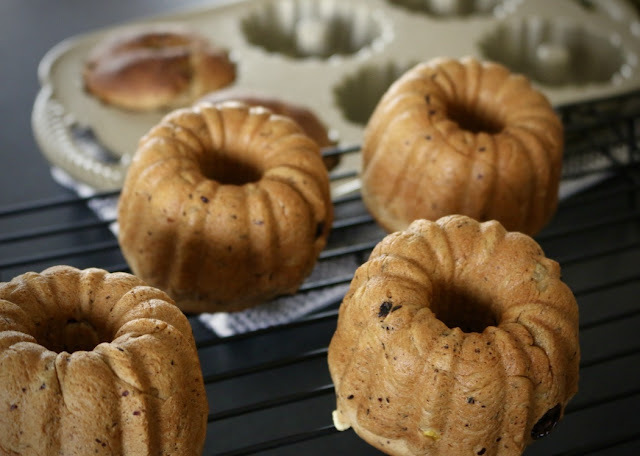 Once the dough is ready place the oven and bake for 10 minutes, then reduce heat to 190℃ and bake for a further 10 minutes (keep an eye on the smaller bundts to ensure that the tops do not burn). Remove bundts from pans and place on a cooling rack, allowing to cool fully in preparation of being glazed and piping crosses on top. Place sugar and water in a small saucepan over medium heat and bring to a simmer, stirring to dissolve sugar. Brush buns generously with glaze. Mix together confectioners' sugar and milk to form a thick frosting. Pipe an X on each glazed, cooled bundt. Add all of the spices to a bowl and whisk until combined. Perfect Hot Cross Bundts. Love the play on words there, Felice. Thanks for hosting. I love these hot cross tiny bundts. Here Hot cross buns are famous on Maundy Thursday and I, run to bakery to get them hot from the oven at 12 noon. I love hot cross buns and can't wait to try these. They look fabulous.